Your newborn baby might need a little extra care since he/she can be are easily infected by bacteria and viruses and what they are wearing should be carefully selected. Their diapers is one of the most essential products you really need to think of because some diaper brands are not made with the high-quality materials which will harm your newborn son or daughter. That’s why we come up with the top 10 best baby diaper reviews to ease all your worries. Read on to find out more. Taking care of a baby is the hardest thing for the new parents if I’m not wrong. They need your care 24 hours a week. However, with this Seventh Generation Baby Diaper, it will ease most of the tasks and let you rest easier than ever. This diaper is made for the baby with sensitive skin and those who can get their skin burnt from their urine easily. It has the ultra-absorbent that will absorb all the urine of the baby in order to prevent leakage, especially at night, so the parents might don’t change the diaper as frequently as they do it in the daytime. Another great quality baby diaper we’ve got here is the Pull-Up Learning Designs Pants for Girls. 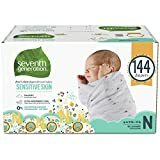 This diaper is specially made for day and night usage, which is very convenient for new, parents who are having a hard time changing their baby’s diaper. This disposable diapers are also equipped with the leak protection, so you don’t have to check your baby diapers frequently like you may need to with other brands. This diaper also helps teach the baby in pulling up the diaper up and down easily. Moreover, this diaper also comes with the Disney designs that will fade away when the diaper is wet and also to show the parents that it is time to change the diaper for their toddlers. Choosing the best diaper for your toddlers is a hard choice until you meet the HUGGIES Little Snuggler Baby Diaper. 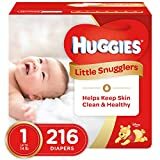 This HUGGIES is the hypoallergenic diapers, which are the ideal choice for the baby with sensitive skin. The GentleAbsorb technology delivers the cushiony layer that will protect between the mess and your baby’s skin as well as stopping the leak. Moreover, to make thing easier for the parent, this diaper has the wetness indicator where it will change color when it is to change. The premium softness and breathability will let your baby play in comfort in whatever situation. Moving on to the next diaper we have here is the Bambo Nature Eco-Friendly Baby Diaper that is designed to minimize the risks of diaper rash and allergy which is the wise choice for those babies that have sensitive skin. This diaper comes with the ultra-absorbent properties, which can be used for day and night, and it is very convenient for all the parents out there, especially, those who just become parents. This diaper is size 1 and can fit the babies whose weight range from 4 to 9 pounds. Next up, we have the Pampers Cruisers Size 5 which is the perfect choice for babies aged from 1 to 3 years old. This disposable diaper will provide the comfort to your son or daughter all day no matter how hard they play and whatever situation they are in. This diaper also does a great job in protecting urine from leaking outside due to its highly absorbent properties. 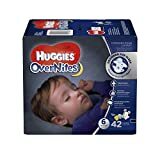 Coming up next, we have the HUGGIES OverNite Diapers. This diaper is specially designed for the night time use to let your baby get a better sleep. It can even be used for the daytime as well due to its highly-absorbent features along with the Double Leak Guard which is effective for 12 hours and that is convenient for every parent. Moreover, this HUGGIES also has the SnugFit waistband to secure fit with 4 sizes available including size 3, 4, 5 and 6. Plus, this diaper is also equipped with the wetness indicator in which the diaper will change its color when it is time to change. 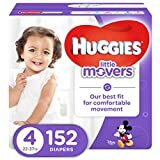 If you are having a hard time finding the best diaper for your baby then this HUGGIES LITTLE MOVERS Diaper should be included in your check-list. This HUGGIES Little Movers is equipped with the best fit for active babies from sized 3 to 6. Moreover, this diaper also has the double grip strips that will secure the diaper twice as flexible on both sides that will deliver the all the comfort that your baby needs in every situation. This disposable diaper also features the wetness indicator where the color of the diaper will change when it is time to change. It also has the high-absorbent leak lock system that will be effective for 12 hours. 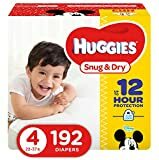 Here we are at the top third rated diaper on our list which is the HUGGIES Snug & Dry Diaper. 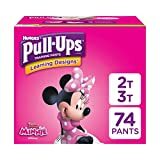 This HUGGIES features with the Disney graphics such as Mickey Mouse that is kid-friendly and fit with the babies that has the weight range from 22 to 37 lbs. Moreover, this diaper is also equipped with the effective leak lock system that will protect the leak effectively for 12 hours. It has the four absorbent layer that will moisture quicker than other leading brands. The wet indicator is also equipped on this diaper as well where it will change the diaper color when it is time to change. 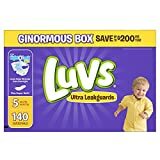 Moving up to another great quality diaper we have here is the Lauv Size 5 that have the ability to provide the ultimate comfort your kids need during the day in every situation they are in. It also has the high-absorbent ability, which will protect the leak effectively. Moreover, this diaper is also fit well with the baby with sensitive skin as well. Saving the best for last, we have the Pamper Swadlers Size 4. For the baby aged 1-year-old up, this diaper is the ideal choice for them. The Pamper will provide all the comfort they need to play comfortably and worry-free in every situation. It also has the highly-absorbent layer that will protect leakages effectively. For the parents who have a hard time choosing the right diaper for their kids, then this is the right pick for them. 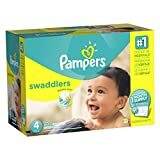 You have just browsed through the top 10 best baby diapers in 2019. We hope you found these reviews helpful and usable as a reference. Any of these picks should be able to meet your needs. Do not hesitate to get one that caters to your baby’s needs the best.